Thank you Infrid, much appreciated. That's why the xdelta is so small I guess, the patching process must have aborted early because of data mismatch. Hey guys, dropping by to let you know I've just tried making an .xdelta version of our CD1 patch and from the looks of it everything went ok, the game started and the English text was there. This was tested using the regular Japanese release, as always, SLPS-02020~1. One thing that surprised me was how small the patched file was in comparison of our original release with the toolkit: 5.05mb uncompressed and 2.58mb with RAR as opposed to 106mb and 56.9mb with RAR! The 5mb must be the difference between the original compressed text images and our uncompressed translated TIMs. Right now I'm working on fixing errors in the translations such as weird colors, typos, missing wordsand such. Give me some time and I'll be posting a v1.1 Disc 1 patch as an xdelta soon. I hope we have been of help ! I'm start to think that the hashes on redump.org are wrong or incomplete, my copy of the game is the SLPS-02020-1 version and it has that hash. So i'm testing the patch but unfortunately i've got some issues , the same of D.O.Eraven one. I'm Italian too and i'm starting to think that there is some kind of problem with the patching process or something like this, linked to my/our win8 O.System. I have the original JAP game version,ripped with Alchool 120% and patched as the readme says: but when i play the game, every emulator i've tried crashes at the beginning after the NAMCO logo. Same problem here. Shame a solution hasn't been found. Though this other option better work. After having played all the missions in Disc 1 and achieved both the Electrosphere (A) and Geopelia (B) endings, I can confirm that the International Edition Disc 1 1.0 patch works properly. First and foremost, I would like to express sincere appreciation and gratitude to DragonSpikeXIII and the rest of Project Nemo team for all the works they did the past years (been following you guys from the start back in 2009). Secondly, having spent an adequate amount of time testing both the patching process and its result after, I am going to list all that I have found so far in hope of offering a workable solution to anyone that is still stuck with some bug or exception preventing them from enjoying this translation. - To ensure smooth caching and streaming between the motherboard's northbridge to your IDE/SATA controller to which your optical drive is connected to, make sure you have the most up-to-date chipset drivers of your respective motherboard chipset. By having the most up-to date drivers for this case, it will ensure your ripping process to be as smooth as possible. Note: This is especially important to Intel chipset boards, which started implementing independent IDE/SATA controllers since late 2008, necessitating the use of the respective Intel Rapid Storage Technology (RST) driver for them to function the way they should. Depending on when your chipset was manufactured, the controllers will only be compatible with a certain driver major version that is compatible for that chipset. For example: Intel 5 series (P55, H55, H57, etc. ), circa 2009, is compatible with version 10 or below; Intel 6 series is v11, Intel 7 and 8 are v12 and Intel 9 is v13. - Due to the way PlayStation CD format works, it is recommended to rip your SLPS 02020/1 game discs first into the CloneCD format (.img/.ccd/.sub) as the original disc image to ensure your ripped image has the most redundant CRC and data integrity as possible, suitable to be the original version for storage and working on. Afterward, you can then convert them into bin/cue as required. - Open a Command Prompt/Windows PowerShell at the location of your patch folder and run the batch process from there to ensure you are able to monitor each step of the patching process and know when something goes wrong to take action. This is especially important in anticipating whether your ripped image was created properly, as the tools will refuse to patch your image if they encounter mismatched checksum with the image file (the error and status messages of the tools are in Italian since the tools being used are from ROMhacking.net, and it would be nice to have them in English to facilitate smoother communication for debugging). - For the most part, having played it through various emulators (with most game time and completion on ePSXe 1.9.1), I can confirm that the patched game functions normally as it should throughout. However, I did encounter emulator crash after the Namco logo through one particular setting: texture scaling. It seems that if high texture scaling is used, it will overflow the emulated cache right when the game starts loading after the Namco logo, crashing the emulator (this might be because the game was made late in the PlayStation life-cycle and used all of its capacity). As such, if your emulator's graphic plug-in supports texture scaling, runs it as low as possible or disable it entirely (this of course comes at the cost of not having high-resolution texture for nowadays' displays, making graphics less-than-ideal). I will keep looking out for any additional exception related to this patch. Hopefully the above information can be of help to everyone! Thanks a for the quality post, Evergreen! Much appreciated especially from someone who's been following Project NEMO since the beginning more than a few years ago. Huge thanks to the Project Nemo team ! You guys made something amazing. If your cd is 7zipped, don't use 7zip to unpack it ! That's what I did at first, but when I tried playing the patched cd, it crashed right after the Namco logo. To make this work, use unPakkiso to unpack the archive. For the patching itself, follow the advice of the kind Ser Evergreen, and run the .bat manually via a DOS prompt. This will tell you if the patching went fine, or failed. And here's an archive containing Pakkiso 0.4, and also a gui for xDelta. Ok this is getting super confusing. According to DSXIII, his patch is meant for the SLPS version. I wonder which it is..
Edit: Ser Evergreen says the patch works on the SLPS (1.0) version and Ikkyu says the patch works on the SCPS (1.1) version, so it seems the patcher is universal. Now if only someone could release a proper .xdelta for the SLPS version..! I think this is getting more complicated than it should as well. I took a look at my files and checked their MD5s s I could add a couple more facts to the table. I checked the MD5 of both my SLPS-02020~1 (1.0) copies of AC3E, and both rips are identical (30f7dce98b6901290cb26c9baf27268f) and correspond to what redump.org lists as the SCPS AKA 1.1 release of the game. As I do not have what redump claims to be 1.0 with checksum 86fd694677098d26909086895404f571, I have no way to comment on this particular release. It's a shame that there are people suffering from issues during the patching process but I can safely say that me and members of Team NEMO have been play-testing for months and not once did we come across any such issues, or any for that matter. It is also reassuring seeing reports coming in from many players that their copies are indeed working on a variety of devices and configurations. Just wanted to pitch in and also give thanks for the patch! I patched Ace Combat 3 - Electrosphere (J) (v1.1) (Disc 1) [SLPS-02020] (md5: 30f7dce98b6901290cb26c9baf27268f) and it's working great. I'm using epsxe 1.9.25 with Petes OpenGL2 Graphics driver 2.9 set to max (including hi-res textures) and have not experienced any crashes so far (played about 4 missions). This is most likely because it has further compression using ecm and unPakkiso decompresses it. But you could just aswell use 7zip and unecm to properly unpack the iso. @contra: Hmm, since I used 1.9.1 instead, maybe 1.9.25 could have provided certain fix or workaround to the overflowing graphic cache? I will try it out. Regrettably, because I used a non-standard method to rip my copy (ripped with UltraISO through an ISO volume filter using an HP DVDRAM GU70N SCSI drive), I could not dump a completely perfect copy, resulting in a hash that is off from the redump.org database to verify properly which version I have. 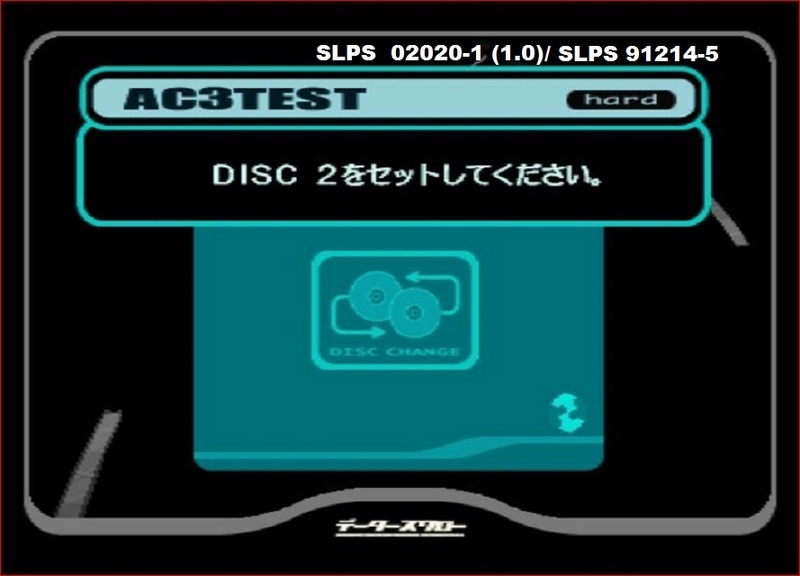 However, I noticed an odd detail: among the contents of the disc, I can see a .bin named SLPS_020.20 (and appropriately enough, SLPS_020.21 on disc 2), but all the data on both discs contain the date/time tag of 1999-05-27 08:20, which matches the release date of SCPS-45397/8 instead. I am not sure how relevant this could be, but it certainly looks strange and adds more to the confusion already expressed by Alcahest. Hopefully we can keep finding out more clues to the nature of the game and the patching process in order to improve and perfect it to allow everyone a chance to enjoy what is arguably the finest release of the AC series! Ser, it's no mystery at all. Both SCPS & SLPS prints have an SLPS executable within. SCPS is just different on the box (product ID for the chinese market). It just seems after the pure Jpn release (1.0), they fixed something or maybe optimized the app some more for the Chinese release. Not knowing what's different between 1.0 & 1.1, I think it's great DSXIII selected the more recent version as base. I was able to try this patch finally (tyvm Ikkyu) and DSXIII you've done an amazing job. I burnt a copy and played it on a PS1 debug and modded PS2, works perfectly. The FMV font is great, perfect size imho, the timing impeccable and the new graphics that show Speed/Defense/etc for planes in english is incorporated very well, seamless. Finally a localization in due form for this masterpiece! @Alcahest: Ah I see, so its still the same source as SLPS 02020/1, just tweaked a bit to turn it into revision 1. I didn't know SCPS 45397/8 was meant specifically for the Republic of China's market, considering the releasing model at the time was quite weird for what constitutes the "Asia" region. Anyway, glad to hear that the .xdelta of Ikkyu works properly for you. Hopefully it could work for the rest of the people as well. However , a long time ago , I played all versions of AC3 ( Including PS The Best ) . The only difference I found between the ver 1.0 and 1.1 is the interface disk change . Sweet. Thanks for figuring that out. Wacked my head off a few walls when it didn't work before. I'll try it out soon. Yippee. Yeah, my original Jap imported version didn't work...so i tried out the 1.1 version and voilà if you need more details, please PM me. so I've been playing this up to the "Dilemma" mission end, and it's a pleasure. Thanks again ! - Erich's message (before or after first mission, can't remember), there's a long dash at the beginning of his talk. Is it normal ? Same thing for one of Fiona's message, and one of Dision's. - during the UPEO/Neucom talk video just after mission 1, there's a square character at the beginning of one of the sentences. - one of the text was written in a heavier font than the rest. I don't remember which text exactly, it was near the beginning of the game, I'd say three missions into the game. I should have noted it down, sorry. - in Keith's message, just before "Dilemma" (after Dision's long speech), there's a repetition in one of the sentence : "is trying to trying to get to us". - there's a typo in the last sentence of the "Electrosphere" ending : "mastermind's aircraft"